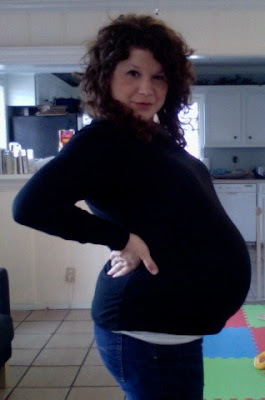 39 weeks pregnant - the baby is due in 5 days! 1. Second pregnancy has proven to be lots easier. Perhaps it is because I am super busy all day with my 19-month-old and have no time to obsess about the small things. Seriously it's like I woke up one day and was already in month nine. It's gone fast and I think it's good that I've been distracted. The first pregnancy everything is new and requires adjustment. This time around I am much more laid back about the entire process. 2. Watching what I eat has proven to be WAY better than eating everything in sight. Sounds simple, but really true. I attended the Bradley Method classes when I was pregnant with Alex. While I loved the classes and the method, there was a lot of emphasis on eating tons of protein and keeping a food log. I found that this made me overly obsessed with what I ate, and usually encouraged me to eat more than necessary. A healthy, well-balanced diet and eating when I'm hungry (without focusing on whether the food is a good protein source or not...) has been much better for me this time. 3. There is no choice but to stay active during the second pregnancy, and I know I feel better physically because of it. I admit that I was not as intentional about exercise the first time due to any excuse I could find - nausea, weather, fatigue, etc. 4. I've learned that I can and should refuse some of the testing that is "required" during pregnancy and some of the newborn treatments that are "required". I think it's important for people to ask questions about their health care. Perhaps it is because I am married to a doctor, or because I am just a naturally analytical person - not sure. But I think asking questions is important. For example, why do I need two different HIV tests during my nine months of pregnancy? Why should I opt for early "genetic screening" for my baby? Do I really need vaginal exams during the last month if my pregnancy is normal? Does my baby really need that eye gunk immediately after he is born? I have found that there are many unnecessary and (sometimes) unpleasant "requirements" from our health providers. 5. I don't take dates with my husband for granted. We have lots of take-out dates at home, babysitters, and adult dinners - dinner for just Jason and I after Alex is in bed. I cherish every moment of time we have to build our marriage and take a small break from being parents for a few hours. It does a marriage good. 6. Being pregnant does not exclude me from serving others or doing what I like to do (photography, cooking, etc.) It makes it more challenging, but doesn't exclude me from it. As my husband says, "Your creative things are good for the soul. Constant housework is not." I agree. 7. The expensive heartburn medicine is so worth it. HA. I like this post!!! It is so nice after the first one isn't it! I must say though, when I refused the HIV tests I think they thought I was a big fat liar that I didn't need one. Here in KY the Doctors are quite pushy! I have been in a battle this whole time to have our baby vaginally. Henry kind of got stuck so now they think even though I have birthed two that I cannot birth this one if he is over 9 lb... good times I tell ya! Ooh! A husband who understands that constant housework is not good for the soul - that's a keeper!! !